2014.11.18 | Margreet L. Steiner and Ann E. Killebrew, eds. The Oxford Handbook of the Archaeology of the Levant: c. 8000-332 BCE. Oxford: Oxford University Press, 2014. £110. pp. 912. ISBN 978-0-19-921297-2. 2013.11.21 | Jonathan Stökl and Corrine L. Carvalho (eds.). 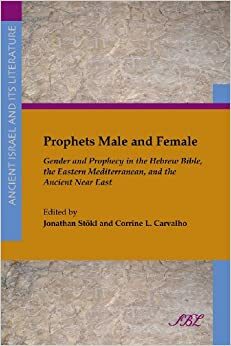 Prophets Male and Female: Gender and Prophecy in the Hebrew Bible, the Eastern Mediterranean, and the Ancient Near East. Ancient Israel and Its Literature 15. Atlanta, GA: SBL, 2013. xiv + 347 pages (PB) ISBN 9781589837768.
Review article by Kerry Lee, University of Edinburgh. Many thanks to SBL for providing a review copy. Prophets Male and Female is an edited collection of papers presented in the Prophetic Texts in Their Ancient Context section of the Society of Biblical Literature’s annual meetings in 2009 and 2010.